There are several ways to prevent or minimize problems when introducing horses to spring pastures. 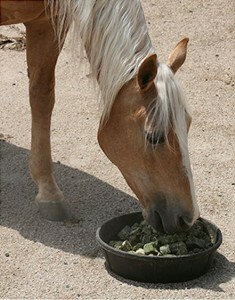 Feeding hay immediately before turn-out may help keep horses from overeating since they are less likely to overeat on an already full stomach. Restricting grazing time will also help minimize risks, and turning out in the early morning may help minimize the number of sugars in the pasture at that time. A suggested schedule is thirty minutes of grazing once or twice a day on the first day of grazing; then increase grazing time by 5-10 minutes per day until the horses are grazing 4-6 hours per day total. At this point, they have adapted to the green grass.